It is anticipated that, the scenario of lupus treatment by 2024 is probably be dominated by AstraZeneca’s anifrolumab, a first-in-class anti-interferon monoclonal antibody (mAb), majorly owing to its virtue in patients with cutaneous and articular action. However, the arrival of new pipeline drugs will serve the requirement for enhanced version of lupus medications, peculiarly for Lupus Nephritis patients, a significant share of patients will remain underserved with methodical medication. The prop of therapeutic options in lupus is provided by off-label therapies that own undesirable safety profiles. 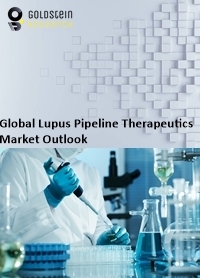 Goldstein Research analyst forecast the Lupus Pipeline Therapeutics Market size is set to reach USD 3.1 billion by 2024, at a CAGR of 10.5% over the forecast years. The report covers the present ground scenario and the future growth prospects of the Lupus Pipeline Therapeutics Market for 2016-2024 along with the prevalence of lupus worldwide along with the sales of drugs and pipeline products statistics with associated market player. We calculated the market size and revenue share on the basis of revenue generated from major players across the globe. On the basis of lupus type, Lupus Nephritis (LN) leads the global Lupus Pipeline Therapeutics Market with the market share of 55% in 2016 due to its growing prevalence of lupus disease, launch of new biologic drugs and awareness among patients. Lupus Pipeline Therapeutics Market Outlook 2016-2024, has been prepared based on an in-depth market analysis from industry experts. The report covers the competitive landscape and current position of major players in the global Lupus Pipeline Therapeutics Market. The report also includes porter’s five force model, SWOT analysis, company profiling, business strategies of market players and their business models. Global Lupus Pipeline Therapeutics Market report also recognizes value chain analysis to understand the cost differentiation to provide competitive advantage to the existing and new entry players. Our global Lupus Pipeline Therapeutics Market report comprises of the following companies as the key players: AbbVie Inc, Asahi Kasei Pharma Corp., Astellas Pharma Inc., Aurinia Pharmaceuticals Inc, Azano Pharmaceuticals Inc., Boehringer Ingelheim GmbH, Bristol-Myers Squibb Company, Deltanoid Pharmaceuticals Inc., F. Hoffmann-La Roche Ltd., GlaxoSmithKline Plc, HanAll Biopharma Co., Ltd., Invion Limited, KPI Therapeutics, Inc., MedImmune, LLC, Omeros Corporation, Ra Pharmaceuticals, Inc., Resolve Therapeutics, LLC, Takeda Pharmaceutical Company Limited and TxCell SA. According to the report, major driving factor for Lupus Pipeline Therapeutics Market is toxic effects of therapy in the past but recent improvements in care have dramatically enhanced the survival of Lupus patients. Inadequate current treatments and patients incompletely controlled disease, progression to end-stage organ involvement continues, and the therapies carry risks of debilitating side effects, making it important to facilitate the development of medical products that have the potential to be more effective and/or less toxic. Further, the report states that the major challenge is prolonged regulatory processes regarding the approval of biologic drugs as clinical testing is done in several phases, and this can take as much as 15 years. For instance, only belimumab has been approved as a biological therapy since 2011. Based on geography, North America and Europe lead the Lupus Pipeline Therapeutics Market with the market share of 65% in 2016 due to robust healthcare infrastructure and research and development activities in developed economies. North America holds the potential for Lupus pipeline therapeutics market as it is estimated that about 1.5 million Americans suffer from lupus. What is the total market size by 2024 and what would be the expected growth rate of Lupus Pipeline Therapeutics market? What is the revenue of Lupus Pipeline Therapeutics in 2015-16 and what would be the expected demand over the forecast period?